A tradition in Door County, Wisconsin. Fish and potatoes boiling in a pot of hot water may seem fairly rudimentary for a culinary experience. But when you take into account that we’re talking about a few hundred pounds of both, boiling outdoors in a large metal kettle over a pile of wooden logs, it’s a whole other scale of operations! Welcome to the Door County fish boil, a Wisconsin tradition that has prevailed over time and is still a big part of the local fabric of the community. Driving around Sturgeon Bay, Egg Harbor, Fish Creek, Ephraim or Ellison Bay, signs for fish boils abound. You can experience a fish boil at many area restaurants. White Gull Inn Restaurant is a popular spot for locals and tourists to see the fish boil spectacle in full sound and color. 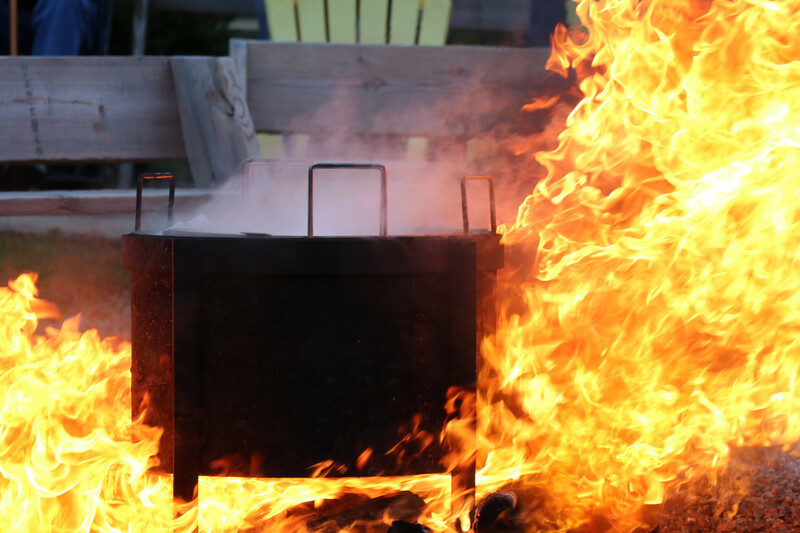 Make no mistake, a fish boil is quite the performance, and there is a method to the madness as the boil master, your emcee for the event, will let you know. The ingredients that make the dish are local: freshly caught Lake Michigan whitefish, local potatoes, and, of course, a local cook who puts the entertaining production together. The only other ingredient is salt, about a pound for every two gallons of water; the salt is used not so much for seasoning as to assist with this specific process of cooking. 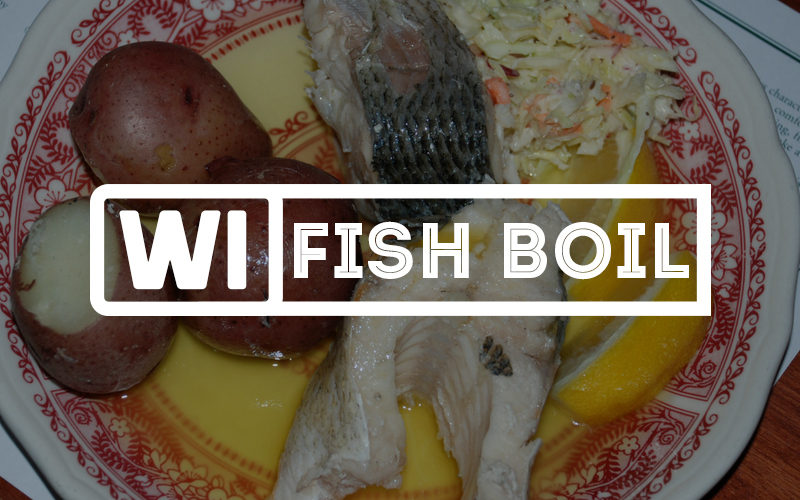 The origins of the fish boil date back to the first Scandinavian settlers who called Wisconsin’s Door Peninsula home. In the late 1800s immigrants who lived and worked in the area sought economical ways to feed large groups of workers. Enter the fish boil, as it is made to this day. Salt is added to water and brought to a boil. Next come the potatoes, and once those are cooked then the fish, cut in chunks, is added into the pot. When the fish is almost done the climax of this drama begins. While you might want to step in closer, tempted by the suspense of how all this will end, the storyline dictates you move further away. Here’s why: The fish oils that you don’t want to eat rise to the surface and that is when the boil master throws kerosene onto the fire. This causes the ‘boil over’—a bellowing volcano that spills the top half of the liquid in this large kettle outward, taking the oils over the sides and creating a bit of a rowdy bonfire effect. 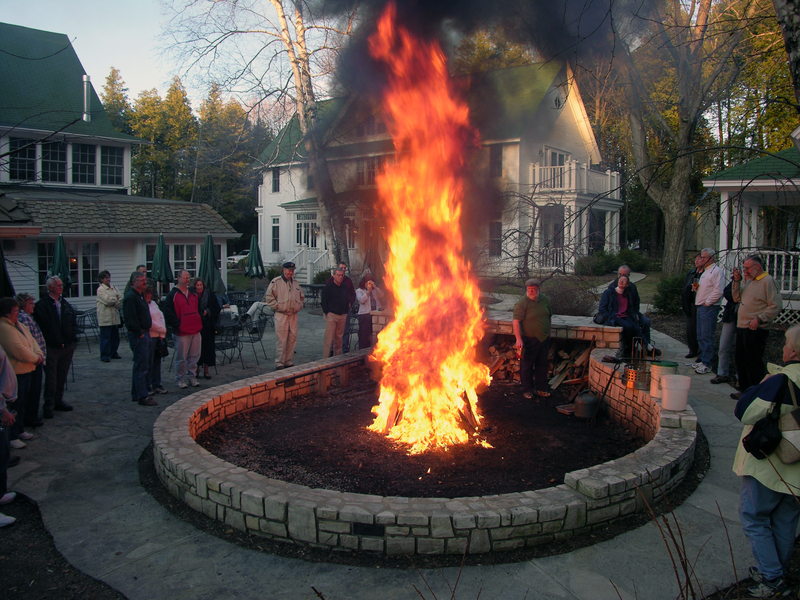 There is no predicting which direction the wind will blow that fire, so it’s advised to keep your safe distance from the ‘scene of the crime.’ Usually the outdoor cooking zone is clearly demarcated with ample boundary on all sides to designate the areas only the boil master and his assistants can access. When all is said and done, and a few hundred photos and videos have been taken, the kettle is carried indoors to serve guests. Lines are typically long so try to get up front for the first serve. Melted butter, lemon wedges, coleslaw, salad and bread accompany the entrée. The memorable meal ends with some signature Door County cherry pie, ice cream optional. Reservations are highly recommended, especially if you are in a large party or celebrating a special event. What started out as a necessity is now an integral part of the Door County dining scene, so tables might not be available some days/nights. Other restaurants that offer fish boils include Pelletier’s, Old Post Office restaurant, Rowley’s Bay, and Viking Grill. Most venues are casual and all feature the usual suspects in terms of ingredients, save for some onions or other veggies thrown in. The grandeur of the audio-visual treat never fails to impress. If you do visit Door County, consider staying a few days at the White Gull Inn, a historic property where guestrooms feature fireplaces and antique décor. In every season, there is much to do in the area, from wine tasting and cherry picking to riding the ferry to Washington Island and snowshoeing at the national park. The fish boil is available all year, so whenever you visit there is no reason to miss it.